Every people has shady, hidden corners of the past that they would prefer to sweep under the rug and pretend didn't exist. For Latter-day Saints, the Mountain Meadows massacre represents the very darkest shadow in our history. The cold-blooded murder of more than one hundred men, women, and children was an inexplicably evil act by those who should have known better, who professed not only Christianity, but a better and purer and more righteous form of it. It's difficult and uncomfortable for modern Latter-day Saints to think about, so many simply choose not to, or attempt to justify the unjustifiable. But pretending the ugly parts don't exist doesn't make them disappear. Ignoring them doesn't make them less visible or less heinous. Rather, it reduces our credibility and diminishes any moral authority we might have. We seem ignorant at best, hypocritical at worst. So it is vital that we learn about our history - both the good and the bad - and are honest about it. As Justice Louis Brandeis declared, "Sunlight is said to be the best of disinfectants." 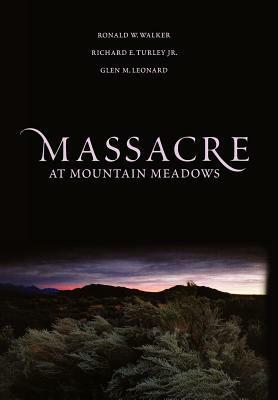 Written by three faithful Latter-day Saints who are professional historians, Massacre at Mountain Meadows shines a bright light on the events leading up to September 11, 1857. Walker, Turley and Leonard gathered primary sources from across the country regarding the massacre, and were given unprecedented access to Church historical archives. "Church leaders supported our book by providing full and open disclosure," they said in their introduction. "Only complete and honest evaluation of the tragedy can bring the trust necessary for lasting good will." The authors excel at explaining events in the context of the time and culture. They cover the deep-seated, and not entirely irrational, fear among the Mormons that the U.S. Army was on its way to invade and occupy their lands. Militant sermons given by Church leaders stirred up a sense of fear and urgency among the members in outlying settlements. The recent widespread revival, later called the Mormon Reformation, led to a religious retrenchment and a suspicion of anyone even slightly out of lockstep with the Church leadership. Even simple aspects like the dry weather and poor crop yield, and difficulty of communicating over long distances before the telegraph was available affected the tragic outcome. 1857 was a busy year for emigrants coming through Utah settlements. After two years of drought, the high number of travelers with cattle led to over-grazing, angering the locals who had to travel farther and farther to find food for their animals. Church leaders, including Brigham Young, fearful of running out of food in case of an invasion, had ordered their people not to sell any grain. Likewise, they were unwilling to sell weapons and ammunition to people who they thought may turn against them in the war they believed was coming. Tensions rose between the Mormon settlers and the emigrants as emigrants tried to buy food and supplies, but were repeatedly refused. Some emigrants were belligerent and insulting to the Mormons. Some locals were likewise rude and condescending toward the emigrants. While thoroughly exploring the causes of the massacre, Walker, Turley, and Leonard repeatedly refuse to make excuses for the inexcusable. There were conflicts on the southern road. But the emigrants did not deserve what eventually happened to them at Mountain Meadows The massacre was not inevitable. No easy absolution for the perpetrators is possible. Their later posturing and rationalization could never overcome one irrefutable fact: All the purported wrongs of the emigrants-even if true-did not justify the killing of a single person. The best that could be argued was that during a time of uncertainty and possible war, some of the Mormons, like other men and women throughout history, did not match their behavior with their ideals. The southern road in late summer 1857 was not just about miles traveled or events along the way. It was also about that complex web of fear, misunderstanding, and retribution that prepares normally decent people to kill. Most everything fit the scholarly pattern: The settlers began to see the emigrants as the 'other' or enemy, believing the outsiders somehow threatened the values and well-being of the Mormon community. Rumors circulated that were untrue or enlarged beyond proportion, and southern Utah society was vulnerable to this excitement. The region was isolated from Salt Lake City. Mixed signals floated down the trail about Indian and emigrant policy. Civil, religious, and military power was dangerously held in the hands of a few. Impoverished settlers knew the virtues of obeying. Don't participate in passing inflammatory rumors along. Keep lines of communication open. Clarify policy and ask questions when something isn't clear. Actively fight against the tendency to see different people as "Other". Refuse to obey orders that contradict your moral code. The best way to honor our pioneer forebears is to learn from their lives and to do better.